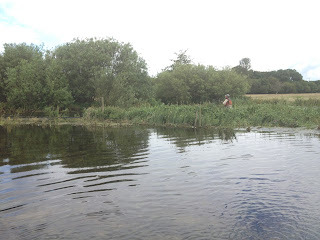 In keeping with the last couple of weeks of despair through continued rain and a nasty case of Flu i was sat on my sofa feeling bored and fed up on Saturday afternoon when i spotted a 'Tweet' (a twitter notification) about the upper river Frome being high but crystal clear and looking very fishable. 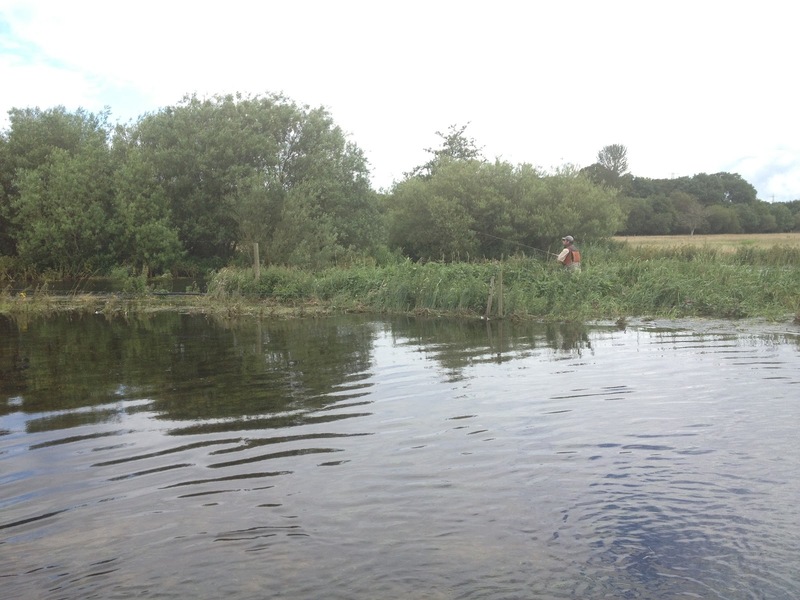 After a couple of messages Mark from Knighton Countryside Management asked if id like to fish the middle river around Moreton. It was an easy decision as i love exploring new waters and had never fished around here before. Arrangements were made and we met on the following morning at 7.30. 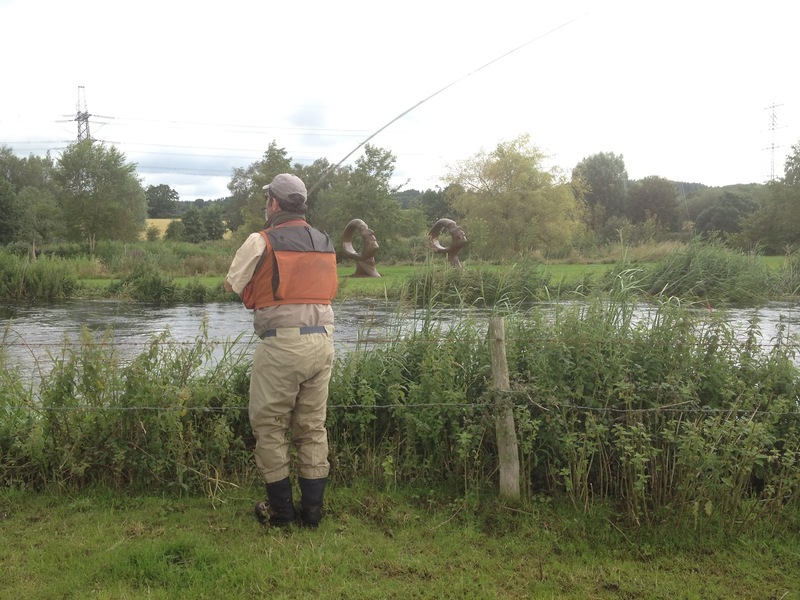 Chest waders were the order of the day just to get to the river bank in many places. The river looked perfect, nice and high and very clear. Mark pointed out that the fishy looking runs of around 3-4ft deep were normally shallow gravelly runs of a few inches deep. 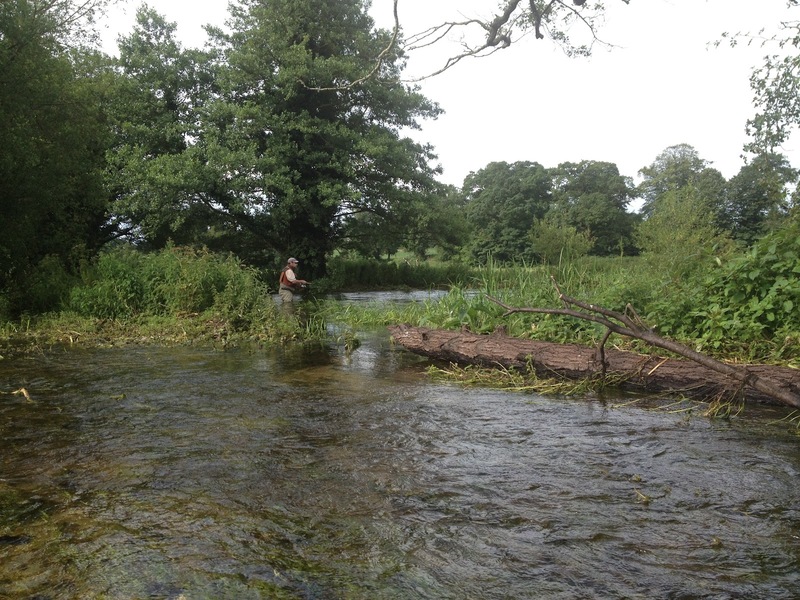 This is a stunning part of the river and we managed to fish a fair length of very fishy looking water. After several good brown trout up to 2 1/2 lb and a Grayling we reached a lovely looking spot where the river is a little wider before it splits into two channels. 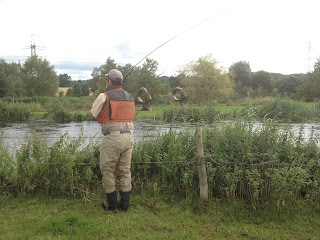 After a couple of cast i dropped my spinner into a fishy looking spot beside a large shrub and was followed by a lovely looking Salmon of about 14lb, the fish lunged at the spinner but didn't stick. We rested that bit of the run with a plan to return on the way back down and try again. As i fished up river there were more nice brownies but no Salmon. Unfortunately upon my return to the spot where the Salmon followed i could not tempt it to come again. We made it back to the car though the flooded fields and retired for a coffee. In the afternoon i decided to head back to the lower river. 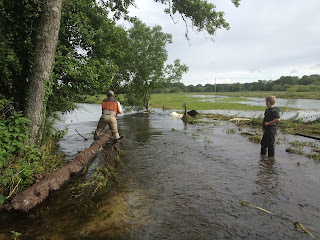 Although very high i was hoping there may be a fish or two about but knew it would be a struggle to get to the river though the flooded fields. The EA river gauge at East Stoke was at 1.53m. When i arrived the water was surrounding the hut and a fair bit of the valley but it looked fishy! I decided that the shallower runs towards the top of the beat would be my best bet as the water was not too turbid even at this height. These runs don't hold fish in low water but i felt they probably would at this height. as i fished my way up river i didn't see any signs of fish but hopes were still high. I arrived at a spot my friend Tony and i always say looks very fishy but we have never seen a fish there before. Today it looked even fishier than usual and after a couple of casts the line stopped and i felt a good pull followed immediately by a big flash, i was in! it looked like a good fish but it continued to lie there shaking its head, worried that it would come unstuck, i got behind it so i could set the hook. The fish carried on thrashing and head shaking despite me giving it line. I was getting very worried as i felt i would come off at any moment. After what seemed like an eternity it took off, not the real screaming heart pounding run i was hoping for but more of a shot burst followed by more head shaking. The fish then sat near the bottom and sulked of a bit before finally coming to the net after what i can only describe as the most boring fight with a Salmon i have ever had. i was still happy to get the fish on the bank (which was about 6" under water) to unhook it. The fish returned very well and swam off strongly having used next to no energy in the battle, even Poppy was relatively un-impressed. It was 32" long so would have been around the 14lb Mark. It had started to colour up but was a stunning looking fish even it it was rather lazy. Every fish I've had this year has been about the same size give or take a pound. As i continued up the run i had a fresh Sea Trout around the pound mark. I moved down river to fish below the middle footbridge a saw a huge splash on the shallow gravel on the other side. as i covered it hoping for a take nothing happened. As the spinner came round i saw a big flash and a spade of a tail as the fish disappeared back into the deep hole in the middle of the pool. I decided to rest this spot and fish it on my way back up. I made my way to the bottom foot bridge and fished my way back up river. Unfortunately no more action came my way but despite the adverse conditions i managed to bank a fish- Mission accomplished and Thanks to Mark for taking me to the lovely Moreton beat and supplying me with some of the the photos for this piece. Maybe next time we'll get a Salmon from Moreton! As i write it appears the the Jet Stream is moving back north and settled weather id coming hopefully bringing with it the long awaited summer and a return to more 'Normal' river levels. hopefully this will see better back end to the Frome Salmon season which ends at the end of August.